The Maui Ocean Center Marine Institute is a nonprofit organization of scientists dedicated to ongoing research and rehabilitation of marine animals, outreach education programs, and the propagation of endangered species of Hawaiian corals. Earth’s marine environment is in constant need of our support. With recent news attention to the tragic health decline of the Great Barrier Reef, it is comforting to be reminded of organizations working to protect, recover, and restore our oceans. Through use of their nonprofit website, MOC Institute is able to educate the public, accept donations, and update the community of Maui on current projects. One project they have continuously supported is the cultivation and care of endemic Hawaiian corals. Due to the warming of ocean temperatures caused by climate change, many reef-essential species of coral worldwide have come under immense stress, diminishing Earth’s coral reef population. The MOC Institute houses a “coral bank” which provides care to many Hawaiian coral species, as well as a cultivation program that successfully propagates coral, eventually returning it to its natural habitat in the nearby ocean. One of MOC Institute’s goals is to eventually build a rehabilitation center for sick or injured sea turtles. Currently, there is no such facility on the island of Maui; all sea turtles in need of care are transported to a rehab center on Oahu which does not have the capacity to provide long-term care. The future plans for MOC Institute include a complete rehabilitation center where hurt or ill sea turtles will be nursed to health, then returned to the wild. Located on the shore of Maalaea Harbor, MOC Institute consistently work hands-on to rescue and rehabilitate a diversity of precious marine life, all essential to the health of our oceans’ ecosystems. 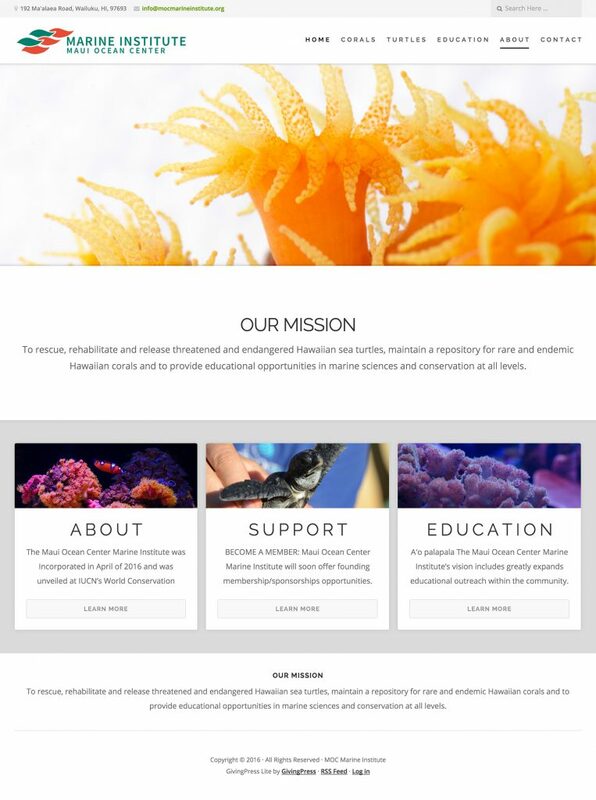 MOC’s nonprofit website feature high-quality ocean photography and images of their coral banks, as well as documentation of current projects. The GivingPress theme’s responsive pages are well-utilized, and contact information is easily accessed at the top of the page, making it easy to receive community support. Without the efforts of nonprofit organizations like these, the ocean as we know it might be quite different, declining at a much faster rate. Through outreach programs and public education, MOC Institute hopes to instill a greater understanding and appreciation of our oceans and the marine life that depend on it. For more information about Maui Ocean Center Marine Institute, visit their website.